I wasn’t sure I was going to make it through this weekend’s Rose’s Alpha Bakers project, nor The Bread Bible bake-through assignment for the month. For one thing, I just got back late Friday night from visiting my parents back home in New Brunswick. For another, we had no “very ripe” bananas in the house, and the assigned recipes for the week each needed some “very ripe” banananana, and it’s pretty much impossible to buy bananananas ripe, let alone “very” ripe. Finally, I started getting a sore throat on Friday morning, and it had developed into a full blown cold by Saturday morning, along with full body aches, chills, and general misery. No fever, though, so, yay? I basically spent Saturday on the couch, got some reasonably good sleep on Saturday night, and felt marginally better by Sunday morning. Well better enough to bake, anyway, given that neither recipe was more than a couple of pages long, and neither involved a crazy number of components or anything super complicated. 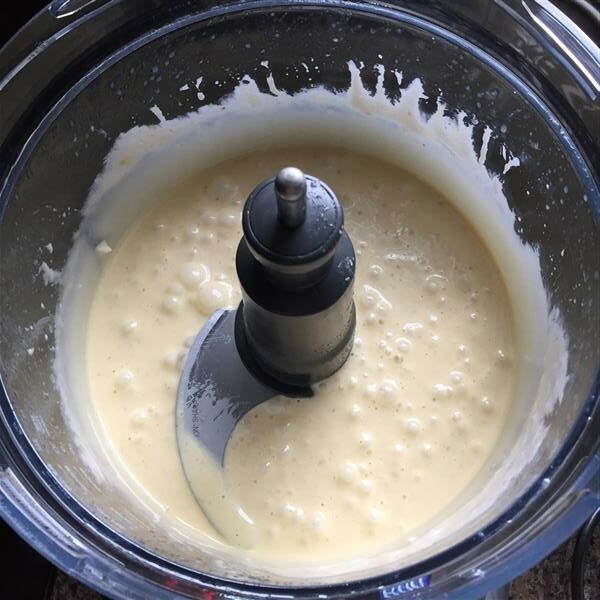 For the chiffon cake, which is what this post is theoretically about, start by pureeing the banana with some oil, then add egg yolks and vanilla. 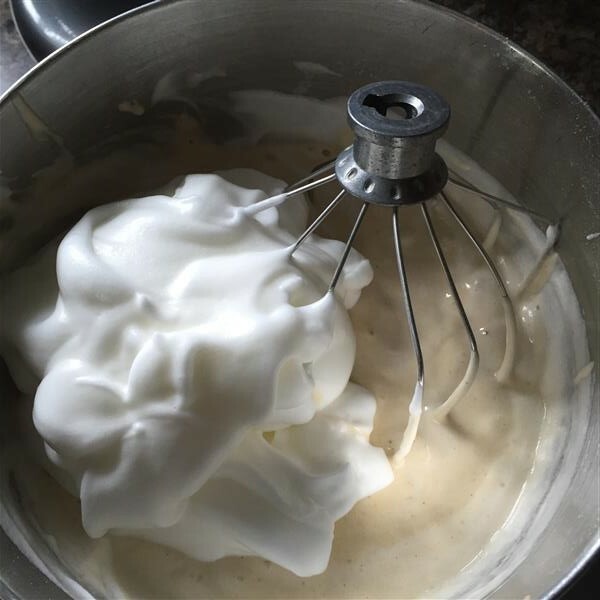 Mix the dry ingredients, add the banana mixture, then whip up the egg whites into a meringue. Fold in the meringue, deflating it as little as possible. I use the whisk beater for this, since it’s my biggest “balloon” whisk. 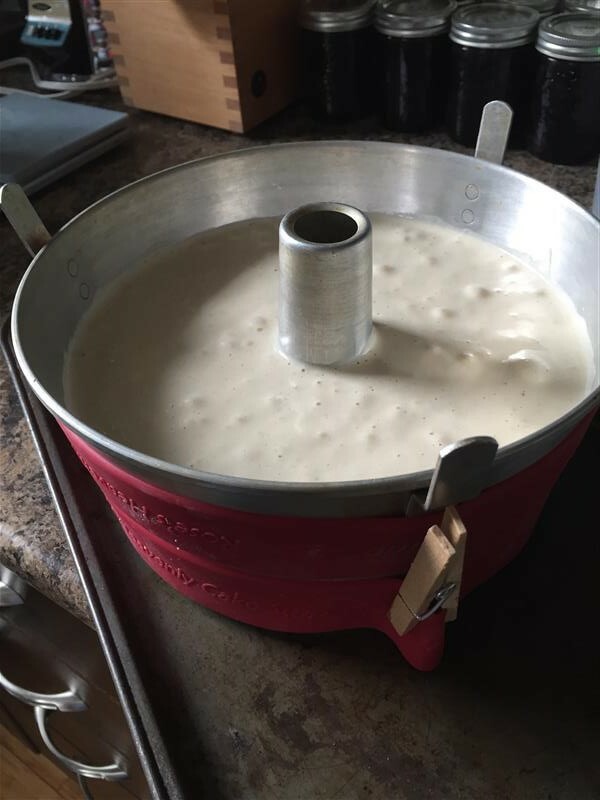 Pour the batter into a two-piece tube pan. My aunt gave me my grandmother’s two-piece tube pan a while ago. I like the results in this old aluminum pan a lot better than what comes out of my non-stick Wilton one. Dad & my aunt both said that grandma made a lot of angel food cakes in this pan, and I don’t find that hard to believe at all. Grandpa was an egg farmer, so there were always lots of fresh eggs to go around, when my dad was growing up. You can see my banananana feather loaf rising behind the cake. 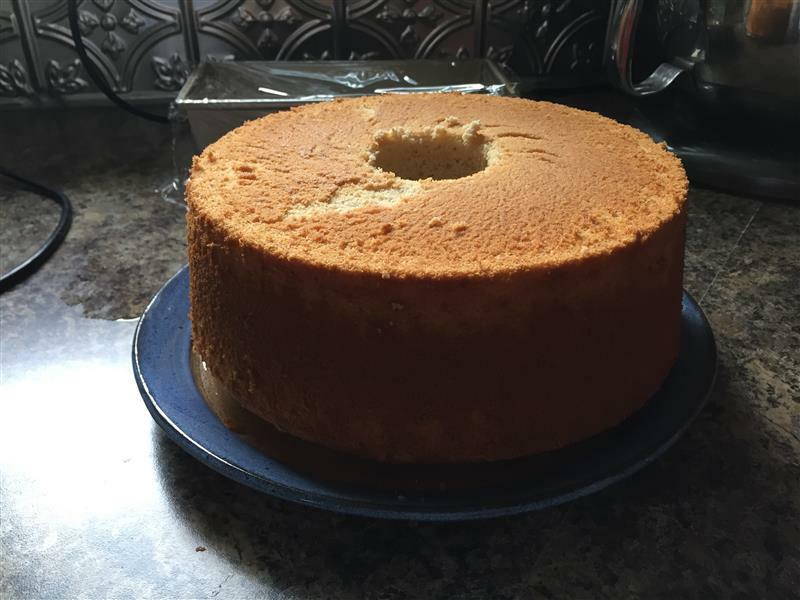 The chiffon cake came out of the pan pretty well, and barely sank at all after cooling upside-down on an elevated rack. I got up the energy to add the chocolate drizzle glaze (basically a thin ganache), but didn’t manage to make the caramel sauce. I may try and make that tomorrow evening, if I feel up to it. Posted on October 5, 2015 by KristinaPosted in The Baking BibleTagged banana, chiffon. It looks wonderful covered in the chocolate ganache glaze! I can’t believe you made both of these recipes while under the weather. This stuff must be marching across the continent; so many people have it, whatever “it” is. I like the story of your cake pan. There’s something about baking in a pan that has been passed down. Feel better soon. …looking back on that old post, I’m amused, because at the time, Doug apparently thought chocolate was unnecessary on pecan pie, but he liked the pecan pie/chocolate combo with *more* chocolate on the mud turtle pie last week… huh. Maybe it is just a “If you’re going to put chocolate on something, make it enough to be worth it” kind of a thing. I think I can get behind that. Mmmmm strawberry preserves, sounds like a great addition. I hope you’re feeling better now.